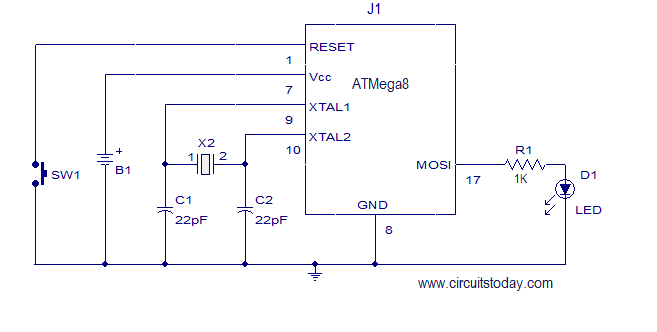 This article teaches you how to add 32K external crystal source toÂ AVR micro controller (Atmega8 ) with circuit diagram & C program. Timing-is one of the basic function, performed by the micro controllers. Every microcontroller has at least one timer/counter module in its architecture. Â However if the counter is clocked internally a few issues may arise in some cases. Sometimes the clock frequency may not stable, or sometimes the clock frequency may be too high than necessary. Sometimes external clock is required to have the required quality. 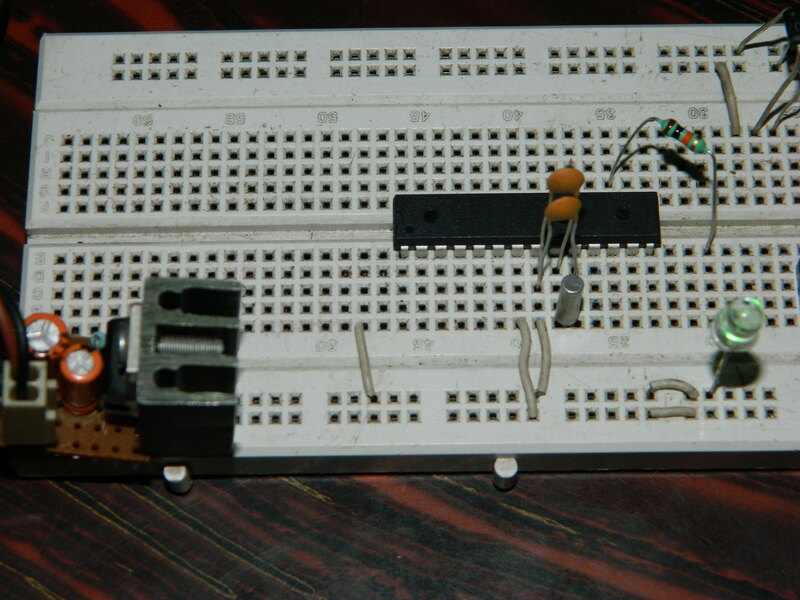 To solve these problems, some AVR micro controllers comes up with an inbuilt oscillator supporting 32.768KHz crystal. User just need to attach the tank circuit along with the 32K Crystal. Human Eye can sense any periodic activity with at least 100mS of period. TCNT2 Pre-scalar can scale down the clock frequency to ATMOST 1024th PART, Pulse Width Modulation (PWM) modes will divide the frequency to 256th part. This can give a period of AT MOST 8 Second (1024*256/32768). In this demonstration, we are pre-scaling the clock to 1024th Part. We can use a NON Pulse width Modulation mode like CTC mode to blink the LED too. In this demo, we are using CTC mode. The DDRXn bit (Data Direction Register â€˜Xâ€™, Bit â€˜nâ€™) must be â€˜1â€™, to which, the OC2 ( Output Compare of Timer/Counter 2) is connected. In case of ATmega8, it is pin no 17 of the IC. Corresponding Data Direction Register is DDRB, and pin no is 3. So let us make circuit and Write the program. TCCR2 =0b10011111; // TCCR2 Configured for CTC mode. Here is a Youtube Video of my experiment! For elaborate details, refer to original Atmel datasheets. For ATmega8 Datasheet, click here. When AS2 is written to zero, Timer/Counter 2 is clocked from the I/O clock, clkI/O. When AS2 is written to one, Timer/Counter 2 is clocked from a crystal Oscillator connected to the Timer Oscillator 1 (TOSC1) pin. When the value of AS2 is changed, the contents of TCNT2, OCR2, and TCCR2 might be corrupted. If a write is performed to any of the three Timer/Counter2 Registers while its update busy flag is set, the updated value might get corrupted and cause an unintentional interrupt to occur. The mechanisms for reading TCNT2, OCR2, and TCCR2 are different. When reading TCNT2, the actual timer value is read. When reading OCR2 or TCCR2, the value in the temporary storage register is read. Asynchronous Operation of Timer/Counter2 When Timer/Counter2 operates asynchronously, some considerations must be taken. These bits control the counting sequence of the counter, the source for the maximum (TOP) counter value, and what type of waveform generation to be used. Modes of operation supported by the Timer/Counter unit are: Normal mode, Clear Timer on Compare Match (CTC) mode, and two types of Â pulse Width Modulation (PWM) modes. These bits control the Output Compare Pin (OC2) behavior. If one or both of the COM21:0 bits are set, the OC2 output overrides the normal port functionality of the I/O pin it is connected to. However, note that the Data Direction Register (DDR) bit corresponding to OC2 pin must be set in order to enable the output driver. When OC2 is connected to the pin, the function of the COM21:0 bits depends on the WGM21:0 bit setting. Table 43 shows the COM21:0 bit functionality when the WGM21:0 bits are set to a normal or CTC mode (non-PWM). Table 44 shows the COM21:0 bit functionality when the WGM21:0 bits are set to fast PWM mode. During asynchronous operation, the synchronization of the Interrupt Flags for the asynchronous timer takes three processor cycles plus one timer cycle. The timer is therefore advanced by at least one before the processor can read the timer value causing the setting of the Interrupt Flag. The Output Compare Pin is changed on the timer clock and is not synchronized to the processor clock. XTAL2: Chip clock Oscillator pin 2. Used as clock pin for crystal Oscillator or Low-frequency crystal Oscillator. When used as a clock pin, the pin cannot be used as an I/O pin. TOSC2: Timer Oscillator pin 2. Used only if internal calibrated RC Oscillator is selected as chip clock source, and the asynchronous timer is enabled by the correct setting in ASSR. When the AS2 bit in ASSR is set (one) to enable asynchronous clocking of Timer/Counter2, pin PB7 is disconnected from the port, and becomes the inverting output of the Oscillator amplifier. In this mode, a crystal Oscillator is connected to this pin, and the pin cannot be used as an I/O pin. If XATAL2 pin is used as a clock pin, Corresponding bits from the Registers associated with the port will read 0. DDBXn, PORTXn and PINXn will all read 0; where â€˜Xâ€™ is the port name, and â€˜nâ€™ is the bit. 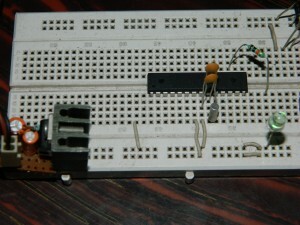 XTAL1: Chip clock Oscillator pin 1. Used for all chip clock sources except internal calibrated RC Oscillator. When used as a clock pin, the pin cannot be used as an I/O pin. TOSC1: Timer Oscillator pin 1. Used only if internal calibrated RC Oscillator is selected as chip clock source, and the asynchronous timer is enabled by the correct setting in ASSR. When the AS2 bit in ASSR is set (one) to enable asynchronous clocking of Timer/Counter2, pin PB6 is disconnected from the port, and becomes the input of the inverting Oscillator amplifier. In this mode, a crystal Oscillator is connected to this pin, and the pin cannot be used as an I/O pin. If XATAL1 pin is used as a clock pin, Corresponding bits from the Registers associated with the port will read 0. DDBXn, PORTXn and PINXn will all read 0; where â€˜Xâ€™ is the port name, and â€˜nâ€™ is the bit. you have left some #includes incomplete. Can you please tell which header files need to be included? Old article I know… but for future readers, I believe the external capacitors were only required because the author did not enable the ATMega’s internal capacitors. To use the internal capacitors for 32kHz crystal, program the CKOPT fuse and also set the appropriate CKSEL bits. See the section “Low-frequency Crystal Oscillator” in the ATMega8 data sheet. I don’t thing you need the two bypass capacitor with low frequency. May be, actually I tried without capacitors too, But I failed. So I decided to include 22pF capacitors in the diagrams. If you refer to the Atmel’s manual upon How to use 32KHz crystals with Atmel micro controllers, they stated that it is not required to attach any capacitors. And the ccrystal should be soldered in the air with those XTAL1 and XTAL2 pins. But as I didn’t succeed practically, I would suggest everyone to stay prepared to attach 22pF caps if the set-up doesn’t work.